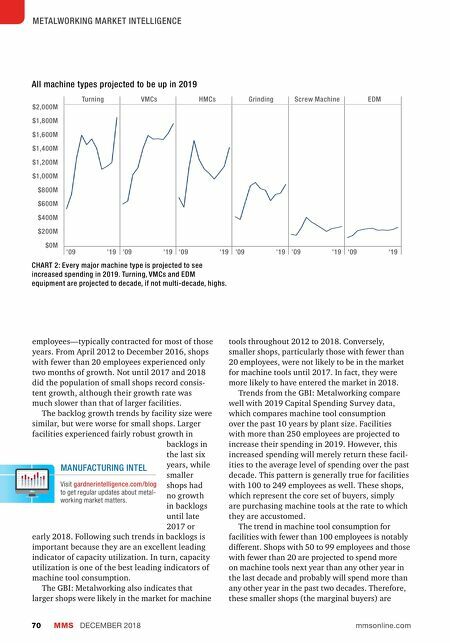 2019 Capital Equipment Spending Modern Machine Shop 71 job shops are generally small, they function as the marginal buyers in the market. The machinery/ equipment and automo- tive end markets plan to spend roughly $1 billion apiece next year. Job shops, machinery/equipment and automotive, which are the top three industry end-market categories, will account for approximately 60 percent of machine tool consumption. Planned spending in aerospace, pumps/valves/plumbing products, electronics/ computers/telecommunications and forming/ fabricating (non-auto) industries should slightly exceed $400 million. These seven industries combined are projected to consume nearly 80 percent of all machine tools purchased in 2019. Spending in the North Central-West region is expected to grow for the third year, reaching almost $2.3 billion next year. This will make the region the largest buyer of machine tools in the country. Spending in this region will be dominated by job shops, which will account for approximately 33 percent of the region's total. The region also will see strong spending from companies in forming/fabricating (non-auto), aerospace and medical markets. Planned spending in the North Central-East region totals approximately $1.8 billion. Combined, these two top regions will account for approximately 60 percent of all machine tool consumed in 2019. Spending in the Southeast region is the biggest surprise of the survey. Shops in this region plan to spend nearly $1.2 billion on machine tools in 2019. This projection is more than 50-percent higher than any previous year for the region. Large increases in aerospace and automotive spending seem to be the reason. 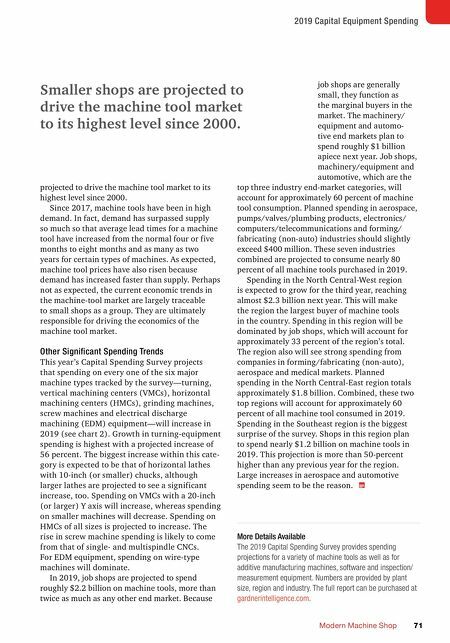 projected to drive the machine tool market to its highest level since 2000. Since 2017, machine tools have been in high demand. In fact, demand has surpassed supply so much so that average lead times for a machine tool have increased from the normal four or five months to eight months and as many as two years for certain types of machines. As expected, machine tool prices have also risen because demand has increased faster than supply. Perhaps not as expected, the current economic trends in the machine-tool market are largely traceable to small shops as a group. They are ultimately responsible for driving the economics of the machine tool market. Other Significant Spending Trends This year's Capital Spending Survey projects that spending on every one of the six major machine types tracked by the survey—turning, vertical machining centers (VMCs), horizontal machining centers (HMCs), grinding machines, screw machines and electrical discharge machining (EDM) equipment—will increase in 2019 (see chart 2). Growth in turning-equipment spending is highest with a projected increase of 56 percent. The biggest increase within this cate- gory is expected to be that of horizontal lathes with 10-inch (or smaller) chucks, although larger lathes are projected to see a significant increase, too. Spending on VMCs with a 20-inch (or larger) Y axis will increase, whereas spending on smaller machines will decrease. Spending on HMCs of all sizes is projected to increase. The rise in screw machine spending is likely to come from that of single- and multispindle CNCs. For EDM equipment, spending on wire-type machines will dominate. In 2019, job shops are projected to spend roughly $2.2 billion on machine tools, more than twice as much as any other end market. Because Smaller shops are projected to drive the machine tool market to its highest level since 2000. More Details Available The 2019 Capital Spending Survey provides spending projections for a variety of machine tools as well as for additive manufacturing machines, software and inspection/ measurement equipment. Numbers are provided by plant size, region and industry. The full report can be purchased at gardnerintelligence.com .